Stories about Bitcoin and the future of cryptocurrencies are dominating the news headlines right now. Over the last few years, the concept of digital currency has entered the mainstream and it seems like everyone you meet has a different opinion. Since bitcoin became the first decentralised cryptocurrency in 2009, its market value has gone through the roof. Many banks globally now accept Bitcoin for payments, as do a growing number of retailers. Will the bitcoin bubble burst eventually? The question is will the Bitcoin bubble ever burst like people are suggesting? Or will other up and coming cryptocurrencies such as Ethereum become the new norm? We set out to find how digital currencies compare against more tangible physical currency such as gold and silver. Cryptocurrencies certainly have a lot going for them. For one, they are currently unregulated by many governments, affording people a certain level of privacy they don’t get from regulated currencies. If you want to keep your finances away from prying eyes, then cryptocurrencies are an ideal solution. They also provide customers with a greater degree of control over their finances as no financial institution or company can take control of your assets. If you use PayPal or any other electronic cash system, then that company have the power to freeze your assets at any time they want should they decide your account has been misused for any reason. With currencies like Bitcoin, you have complete control of your wallet and any coins you have stored in it. Another major benefit of Cryptocurrencies is that transactions are generally much harder to hack than other forms of online payment. This is because they use blockchain technology which is designed to discourage fraudulent activity. It is impossible to change or alter the encryption in one block without having to change every block that has been before it or come after. So why do many people still have doubts about cryptocurrency? Well, the obvious problem is what happens if the user encounters some sort of problem with the technology. Digital currency isn’t tangible in the same way that gold and silver are, making it much harder to insure and if accidentally lost or stolen then it is very hard to recover your coins. There have been many instances where people’s hard-drives have crashed resulting in them losing their coins and having nothing to show for it. Transactions are also currently expensive in Bitcoin as well as the current speed of transactions being relatively slow. With technology improving every day, it is impossible to predict where we will be in the next few years and there is nothing to guarantee that cryptocurrencies won’t be replaced by something else. Gold and silver will always have a material value and have proven to be an excellent store of wealth for thousands of years. If there was ever to be a worldwide digital crash, then cryptocurrencies would be essentially worthless. There are also a lot of people investing in cryptocurrencies that don’t completely understand what they are investing in, which is why many experts believe the market is headed for a crash. Evidence of the markets unpredictability can be seen clearly in the huge rises and drops in the value of Bitcoin over the last few years. Although gold and silver prices fluctuate they generally tend to be a lot more stable than cryptocurrencies. People have always tended to gravitate towards gold and silver investments as an insurance against market uncertainty and a potential crisis. This is unlikely to change anytime soon. Many people still see gold and silver as the best form of protection against inflation and often purchase it as a hedge. Evidence of this can be seen in investors reaction to recent global events such as Brexit and the announcement of Trump as president when the demand for gold and silver suddenly went up overnight. In the event of a crisis, it will be much harder to get your hands on physical cash and cryptocurrency is still not readily accepted by many vendors. Therefore, it makes sense to invest at least some of your money in physical assets that are fairly liquid such as gold and silver. The fact that gold and silver are considered scarce and finite resources also mean that there will always be plenty of demand for these types of assets. Physical Gold are specialist dealers in gold and silver. We offer a wide range of investments including gold or silver bars, bullion coins and collector’s coins. 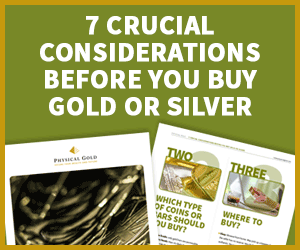 For more information on any of our stock or advice on how to invest in precious metals, why not give us a call on 020 7060 9992 or visit our contact page? This entry was posted in Blog and tagged cryptocurrencies.